This Cable Sign Supply that Presents Posters in Landscape Orientation is an Acrylic Holder! Storefront Windows are Great Locations for Prominent Displays! 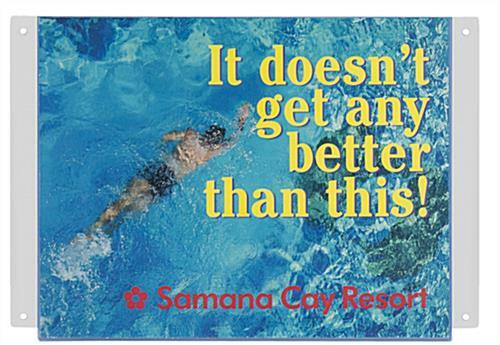 Check Out the Full Selection Online for the Most Appropriate Sign Supply! Cable sign holder has (2) s-hook for connecting to other frames. Clear acrylic is precision laser cut for a flawless cable sign holder. 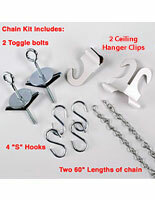 Compatible with KITCH60 hanging kit [sold separately] for customers requiring hardware. This cable sign holder that forms a window display is specifically designed for businesses to buy several units and connect them together. This allows advertisers to construct a window display with exactly the number of acrylic poster frames required for individualized needs. The result is a cable sign holder with vertically stacked frames. 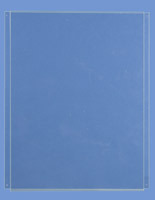 Users can hang these ceiling suspended displays in a window or another highly visible location. 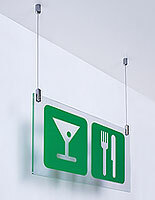 Each cable sign holder, also known as a ceiling suspended window display, is frameless and double-sided. 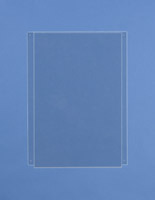 Prints easily top load into the clear acrylic frames. 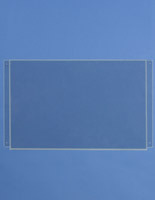 The poster frame, cable sign holder hangs in landscape format only. 11" x 8-1/2" Advertisements top-load into this unit, which takes only seconds. 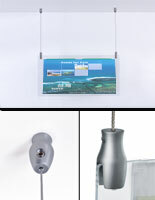 The landscape format cable sign holder allows users to print new advertisements on the office computer, as 11" x 8-1/2" is a standard paper size. This cable sign holder, also known as an acrylic window display, comes with (2) s-hooks for connecting to other 11" x 8-1/2" frames. Unlike frames that connect with clips or clamps, the s-hooks require no additional tools for installation. Additionally, the s-hook sign fixing is much more affordable than standoffs or other signage hardware. The pre-drilled holes are 3/16" in diameter and 11-12/16" apart [center point to center point]. So these units can only be connected to frames with identically placed holes. 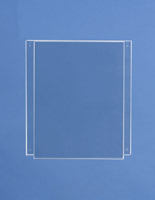 The frame is precision cut from 1/8" clear acrylic, resulting in a quality window display. These ceiling suspended signage holders are one of the most affordable fixtures available for storefront advertising.